If you’ve never made cauliflower rice, you’re in for a treat. Trust me, it’s not as difficult as it sounds. If you are going low carb or paleo, you will be happy to know you can reinvent you favorite rice bowl meals with this simple process. And you know what else? It only takes 10 minutes to get oven ready and then you can pretty much forget about it until the timer goes off. My sometimes skeptical husband loves it and prefers it to brown rice. I made Cauliflower Rice Asian Bowl for a mid-week dinner. It was a bit of a throwback to the way we used to eat building a meal around brown rice. However this welcome change brought a greater presence of veggies to our dinner bowl. Yay! It does require a food processor with an “s” blade to chop the florets into a rice like consistency. If you are using a large head of cauliflower, you will want to do this in two batches to avoid over crowding. But it has a beautiful rice like texture when done. This low maintenance “rice” recipe is from Mel Joulwan’s blog, The Clothes Make The Girl (hah! about food, not clothes). It’s an oven roasting process that requires little hands on time and 25 minutes in the oven while you make the rest of the meal. 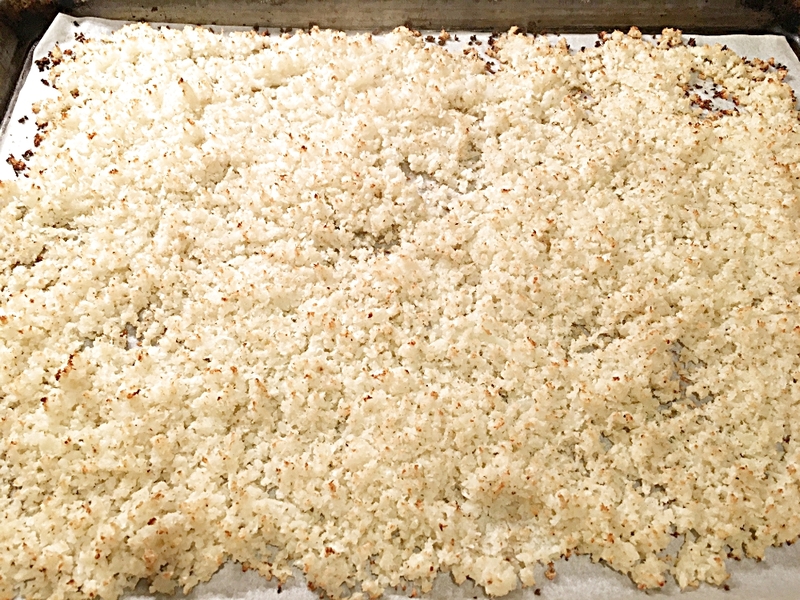 Toss the uncooked “rice” with a tablespoon of melted coconut oil, sea salt, spread it on a parchment lined pan in a thin layer and roast it until it has brown flecks. Now here’s some good news for those who don’t want to bother making cauliflower rice…Trader Joe’s sells frozen organic cauliflower rice! You can find it in the frozen veggie section. When you see it, stock up, because they run out often. 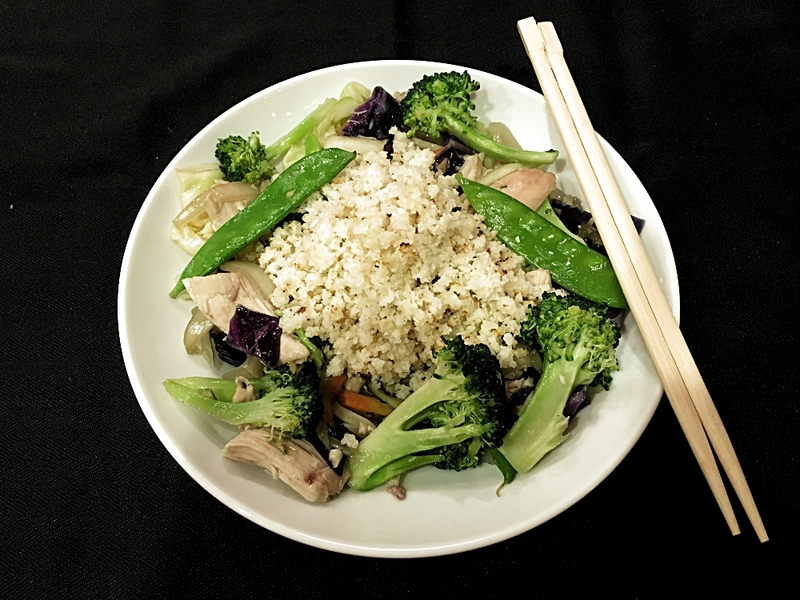 While the cauliflower rice is roasting, pull together your vegetable and chicken stir fry. I use leftover roasted chicken. See Sunday Dinner Roasted Chicken for the recipe. 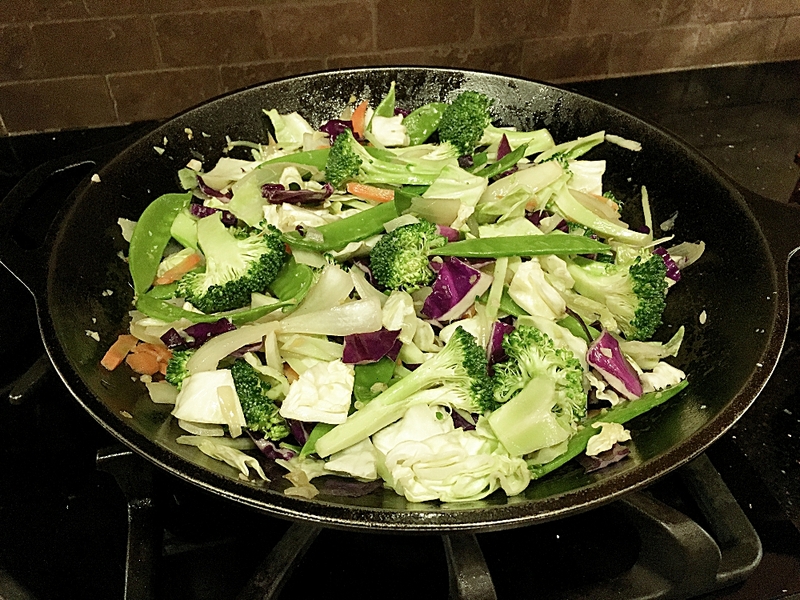 Stir fry is a quick way to cook veggies in a hot pan. Get all your veggies cut and ready, having them handy to toss them in the pan when ready. Begin with roasted sesame oil to bring an Asian flavor, sautéing fresh ginger and garlic with red pepper flakes. Add the chopped onions and saute until soft, about 7-8 minutes. Stir in the carrots and broccoli stem cut in matchstick pieces. These guys need a little more time in the heat, so they go in first. Add the rest of the veggies, stirring to coat with the seasonings and sesame oil. You can easily make this your own by changing up the veggies. Think color. Here I’m using a blend of onions, carrot, broccoli, snow peas, purple and white cabbages. When it’s time to add the chicken (or protein of choice) move the veggies over to make room for it. Then fold in the roasted chicken pieces. When the whole beautiful mess is mixed together, add the sauce (complete recipe below ⇓). Taste and adjust seasonings. By this time the cauliflower rice is done. Pull it out of the oven, serve up and enjoy! * A note about Mirin, an ingredient in the sauce. It’s a rice wine that really enhances the flavor in stir fry’s. Please read ingredient list on this product and watch out for sweeteners. I use the Eden brand, on the shelves of your natural food grocer. It has clean ingredients and no sugar or corn syrup. If you don’t have Mirin, you can use rice vinegar. 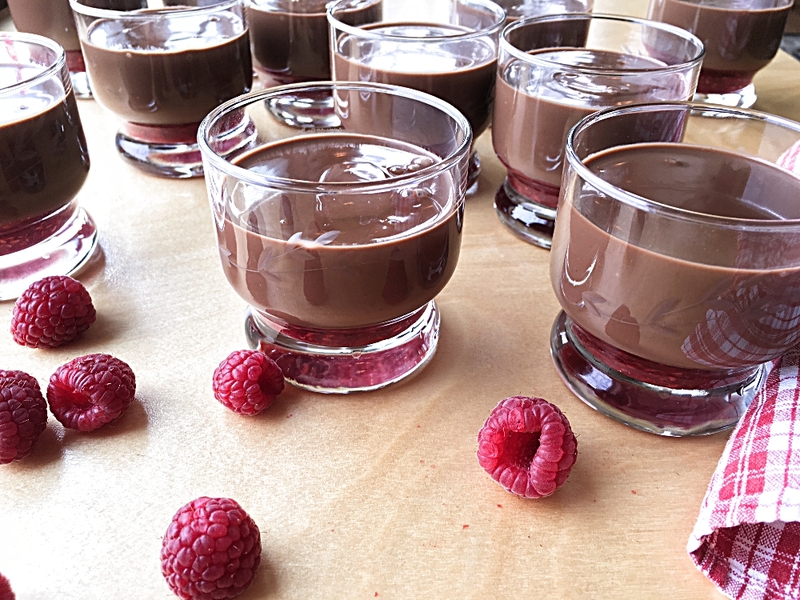 This dairy free, refined sugar free, and gluten free chocolate raspberry parfait was a hit! This pic was taken before I topped it with coconut whipped cream. Excited to be repeating this menu in a Feb 13th class. Start with making the cauliflower rice. Preheat oven to 425 degrees. Line a large rimmed baking sheet with aluminum foil or parchment paper. 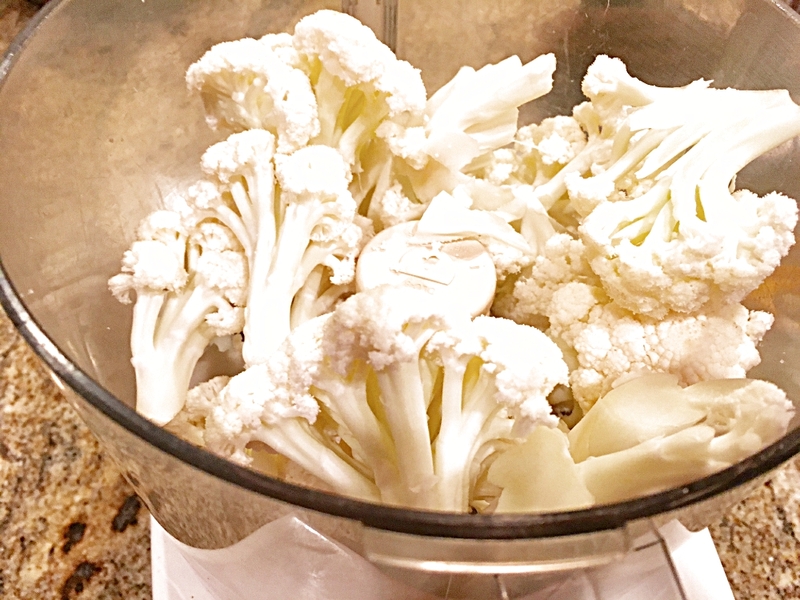 Break up the cauliflower into florets, removing stems. 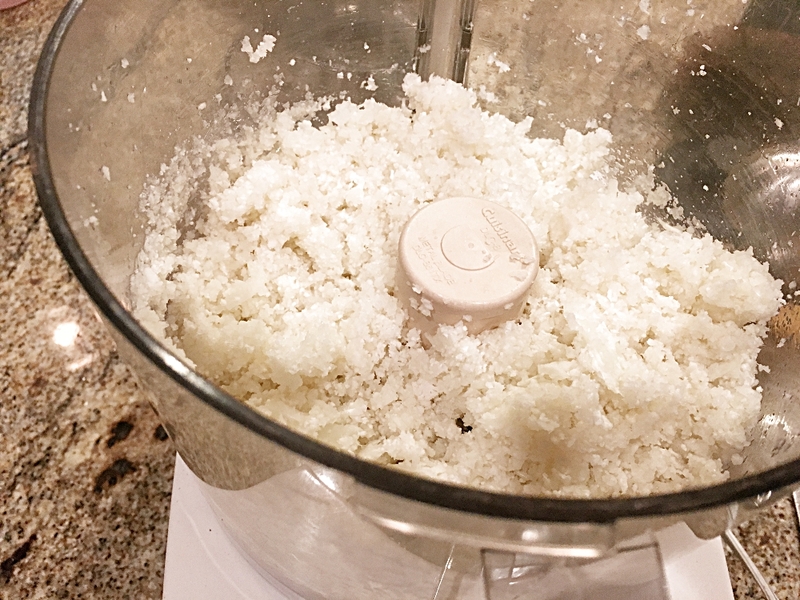 Place half of the florets in a food processor and pulse until the cauliflower looks like rice. This just takes about 10 quick pulses. Repeat with the remainder of the florets. In a large bowl, toss the cauliflower rice, melted coconut oil and sea salt together. Spread in a single layer in your prepared pan. Roast for about 25 minutes, until it’s flecked with brown spots. While the cauliflower is roasting, make the stir fry. 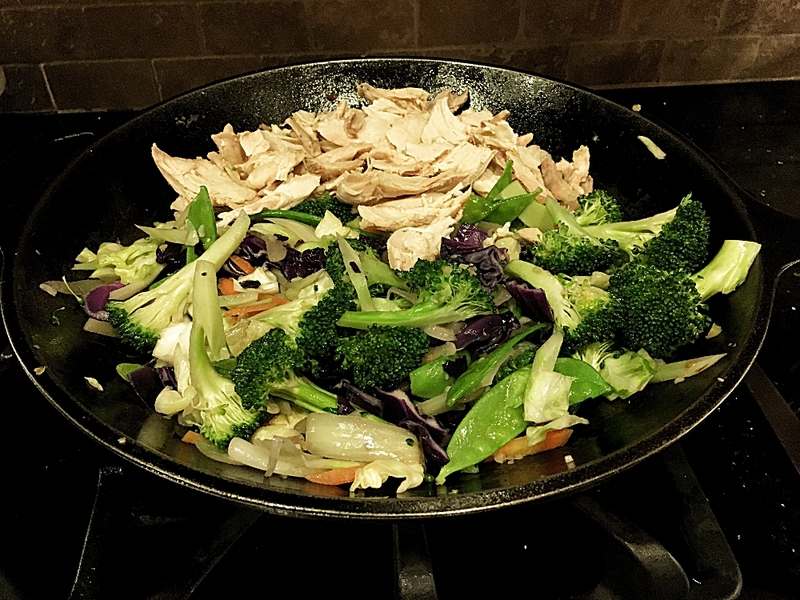 A few tips to help your stir fry be a success…maintain a medium heat throughout, and your oil in the very beginning should be hot enough that the spices sizzle when added, but don’t allow oil to get so hot it smokes. Have all ingredients ready to add because once you start, it goes fast. 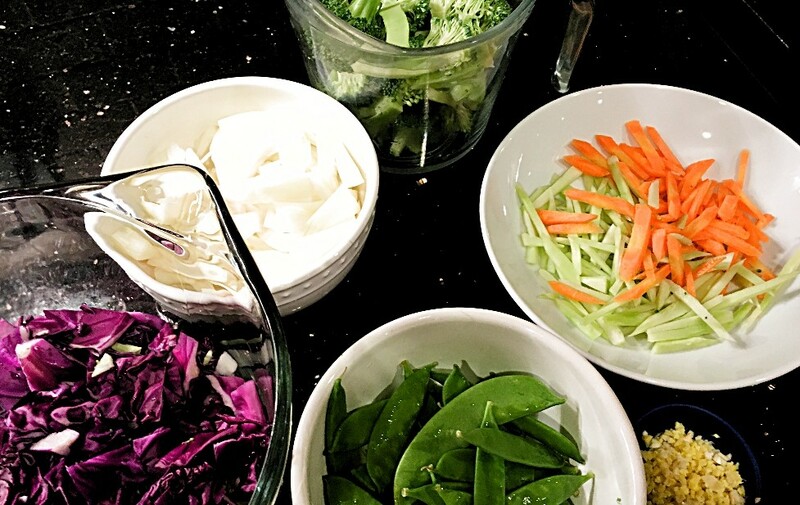 Wash and chop all your veggies for the stir fry. Set aside. 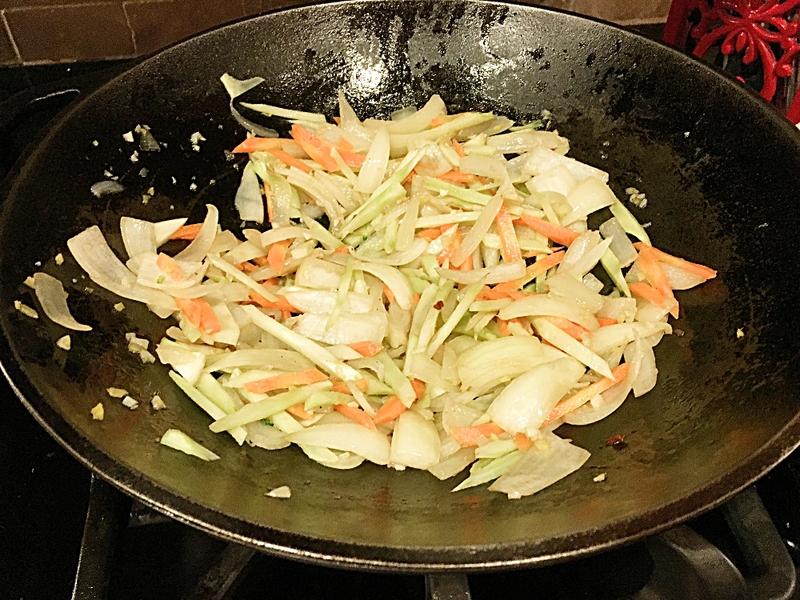 Warm the sesame oil on medium heat in a large wok or stir fry pan. When heated add the ginger, garlic and red chili flakes. Saute for about 20-30 seconds to flavor the oil. Add the chopped onions, stirring and cooking on for about 7-8 minutes. Stir every now and then to keep them from browning. Maintaining a medium heat, stir in the carrots and broccoli stems. Cook 3-4 minutes. Mix in the cabbage, broccoli, and snow peas. Hint: Adding a pinch of salt here helps the vegetables cook a little faster. Cook and stir occasionally until broccoli is tender, about 8-10 minutes. Move vegetables over to one side of the pan making room for and adding the roasted chicken pieces. Fold chicken into vegetables. Gently toss and cook, mixing all ingredients evenly. Give the sauce you set aside earlier a stir, making sure arrowroot powder is dissolved. Combine with stir fry, gently tossing together, letting the sauce come to a boil. Cook 2 more minutes. Adjust seasonings if needed. Serve on a bed of Cauliflower Rice.